Today at Kadic Academy, 8th and 9th graders have Driver’s Ed. Ulrich and William both want to impress Yumi, and are at each other’s throats. Meanwhile, X.A.N.A. has launched a new attack. In an attempt to wipe out its enemies (with the exception of Aelita whose memory he needs), X.A.N.A. has found a way to materialize Krabes in the real world. The fight against X.A.N.A. is tougher than ever… and Ulrich and William will be forced to join forces. And that’s not easy for two kids who can’t stand each other! The evening is already over and the heroes exit the manhole in the park. 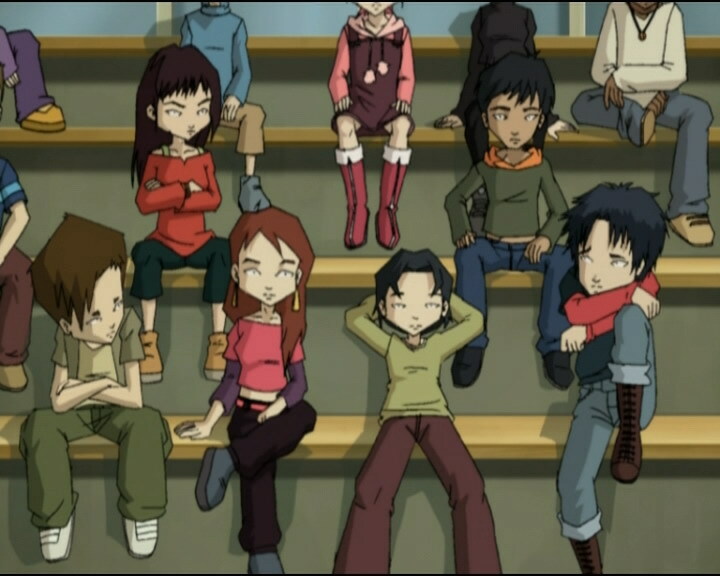 The boarders prepare to return to the dorms, and as usual, the goodbye between Yumi and Ulrich is sweet and timid… While Yumi disappears into the night, Odd, Jeremy and Aelita urge Ulrich to tell her about his feelings. Yumi arrives at her house and runs into William who was waiting at her gate to declare his love, even trying to steal a kiss. Ulrich catches up to Yumi at this moment and misunderstands the situation, running away very upset. However, Yumi rejects William and when he asks if it’s because of Ulrich, she remains straight-faced and quiet. 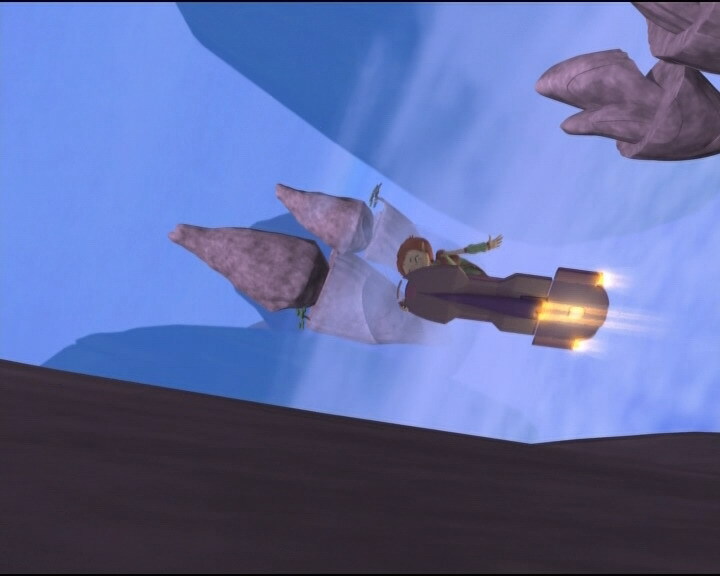 In the night, a tower is activated in the Mountain Sector and a Krabe climbs out of one of the scanners. The next day brings an introduction to driving with a supervisor. Curiously, Ulrich coldly refuses to acknowledge Yumi and the students each take their turn at the wheel. Only William manages a decent performance and dares Ulrich to do better. The martial arts student fails in front of the two classes and when his rival teases him, he loses his temper and tackles William right in front of Yumi, who becomes outraged. Jim separates them with authoritative arms and takes them to the principal. 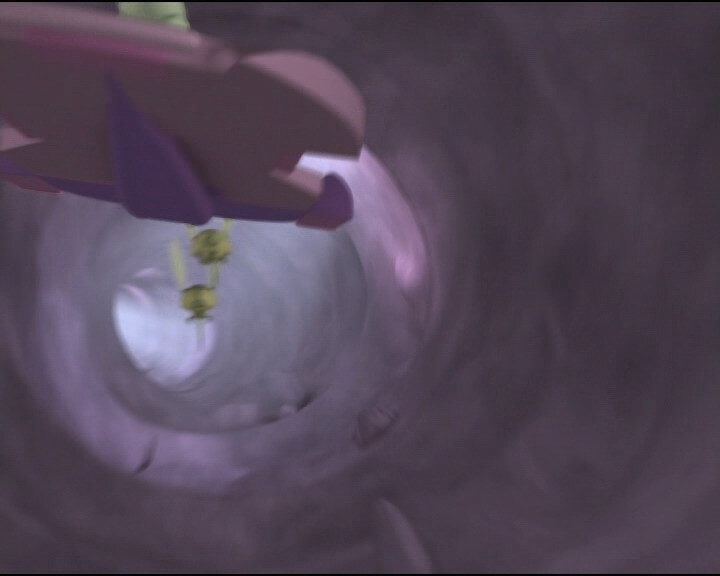 Jeremy realises that a tower has been activated and the group, aside from Ulrich, head to the factory. At the Ishiyama’s house, a hard knock sounds at the door, and Yumi’s mother discovers a Krabe on the other side! At the factory, the four kids discover a second Krabe materialised by XANA. Yumi separates from the group to find her family. Odd, Aelita and Jeremy reach the lab when Odd distracts the Krabe. In the scanner room, only one is left intact, the other two having been severely damaged by the materialisation of the Krabes… Aelita is virtualised but when Odd gets ready to follow, the third scanner shatters, and a newly-materialised third Krabe emerges from the debris. 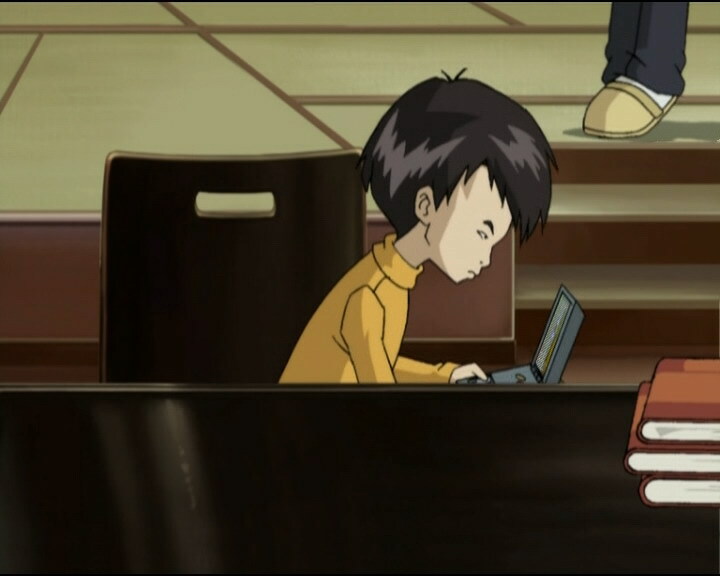 Aelita is alone on Lyoko and Odd is being changed by the monster, now real instead of virtual. Aelita goes to the tower alone, Hornets on her heels. Odd distracts one of the four-legged beasts in the factory. Yumi arrives at her house, just as the Krabe does. Ulrich sees a monster at Kadic and decides to confront it with William, his rival. The pair then separates, Ulrich running to save the Ishiyama family and William borrowing the driving school’s car and driving to the factory. 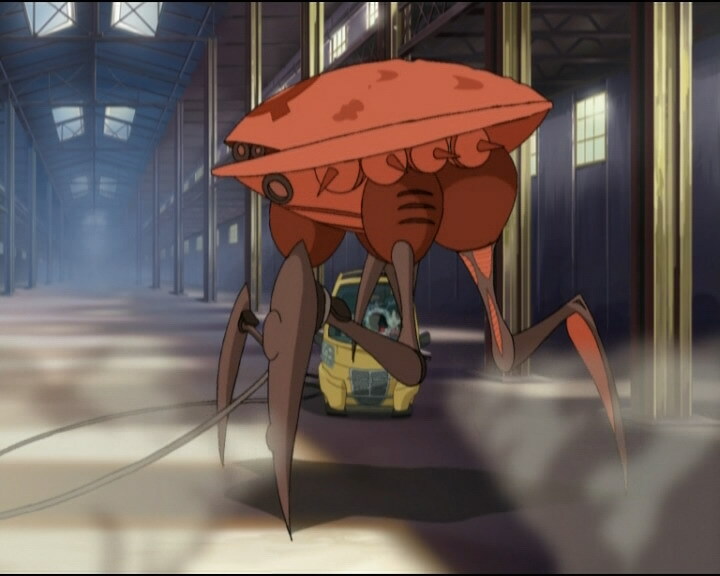 On Lyoko, Aelita loses her vehicle to a Tarantula guarding the tower. She tries to flee when the Scyphozoa arrives, but is cornered by several monsters. But Aelita finally reaches the Tower by force, duping the Scyphozoa with a lure, an illusion… The code is entered in time to save Ulrich. The next day, soothed to know that there’s nothing going on between William and Yumi, Ulrich doesn’t repeat his error of starting a fight, and William proposes he join his karting club. 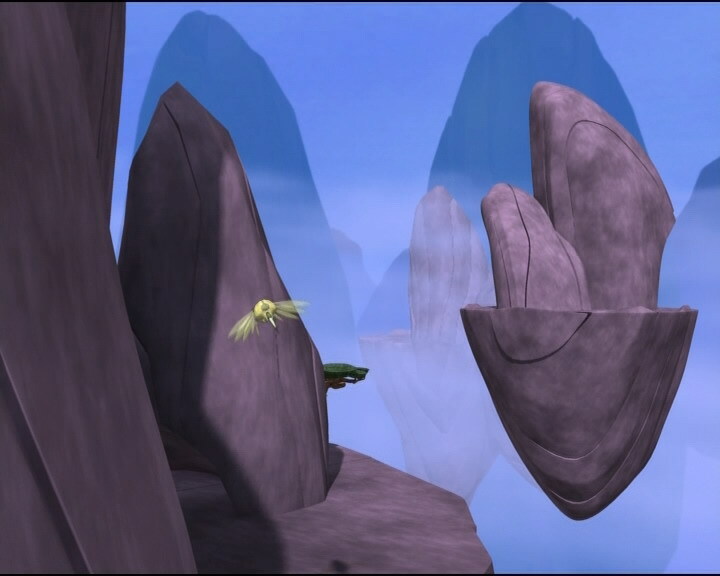 - Attack: Materialise three Krabes; two at first to leave only one functional scanner, then the third after Aelita has been sent to Lyoko. The targets are the school, Yumi’s house and the factory. - Return to the past to repair the scanners and the lift, which were destroyed by Krabes, and heal Ulrich and Yumi’s wounds. - New chapter in the Yumi-Ulrich-William love triangle. After being persuaded by the others, Ulrich decides to go to Yumi’s house to tell her about his feelings. Ironically, he finds William doing the same thing and runs away. William takes a beating. Later, when Ulrich orders him not to hang around his group, he retorts that in the game to win Yumi’s heart, he’s not in first place. - First time Aelita confronts XANA’s monsters alone on Lyoko. 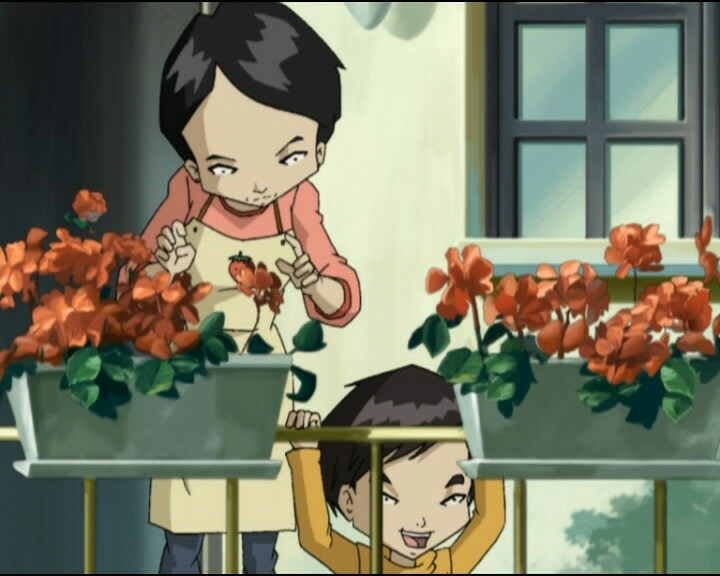 - Second time Aelita creates a clone of herself to fool XANA. - Hiroki thinks his sister should go out with Ulrich. - Jim doesn’t cope quite as well against the Krabes as he did with the Kankrelats, but equally as bravely. - William belongs to a karting club. - New episode about Jim’s past, which he’d rather not talk about: Jim was in the army; Corporal Jim Morales, 7th engineer battalion, service number 9-2-12-1. - Aelita’s outfit is reversed before she enters the Code Lyoko. - Jim’s band-aid is entirely white when he’s annoyed that Ulrich’s phone rings and when he cries “Geronimo”. - When Odd tells Ulrich he’s no better a driver than he, Hiroki can be seen on the bench but he’s not enrolled at Kadic. - The lock on the gate to Yumi’s house disappears in the shot following the one where she closes the gate on William. - Yumi says that XANA virtualised Krabes on Earth! Until proven otherwise, it materialised them, not virtualised. - The handle of the door to Yumi’s house is on the left instead of the right when Mr Ishiyama comes back from work and before the Krabe shoots Yumi. - The bottom of Odd’s pants are torn when the Krabe falls into the lift shaft and at the moment when he tells William he’ll forget everything, his pants are no longer torn. - The factory microphone is in Jeremy’s other ear during one shot and the cord disappears at the moment when he asks Odd what kind of problem it is when he’s in the scanner room. - First mention of the game Ultimate Blaster 2; in the previous episode Jeremy mentioned the first version to Ulrich. - Second time XANA materialises monsters on Earth, along with episode 26 “False Start” with Kankrelats. - Second altercation between William and Ulrich. - Jim reads the same comic as in episode 5, “Big Bug”. - Jeremy doesn’t press the usual key to launch the RTTP. - The armour Yumi’s dad dons is the same as in episode 10, “The Girl of the Dreams”. - The police car is probably inspired by a Peugeot 306. Odd (tapping his forehead): Hello? Anyone home? Jeremy: What are you waiting for anyway? Aelita: You know they’re right, Ulrich! You really oughta go for it! Odd: No, wait ‘til she starts going out with another guy, because she’s sick of waiting for you to make a move, right? Yumi: William? W-what are you doing here? Are you crazy? Odd: So then I told her I was going to order a t-shirt on the Internet, and she asked if it was going to come out of the printer! Odd: Here’s our hero! Hey champ, how’d it go? Aelita: Well then…I think I’m going to go to bed, I’m tired. Odd: Well? What happened, huh? Principal: Our physical education teacher Jim will assist you as well. Jim: Corporal Jim Morales, seventh engineering battalion, service number 9 2 12 1! Officer: At ease. You were in the army? Jim: Uh…I’d rather not talk about it, captain. Officer: I’m only a warrant officer! Principal: Yes well, erm, I’ll turn operations over to you, um…Jim. Can I count on you? Odd: Yeah but what about after? What happened after he followed you to your place? Odd: Hey, you’re not any better than I am! What a morale booster! Ulrich: Will you just shut up? 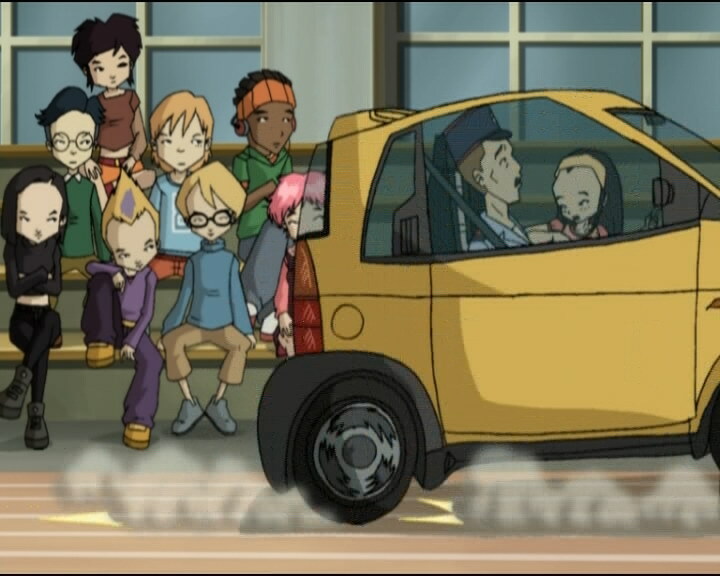 William: Hey, it’s not Odd’s fault that you drive like a dork! Principal: Jim, take them to the library. Jim: Yes general! Uh…I mean…right away, Mr Delmas! Odd: Don’t worry, Aelita, it’ll work out. They’re not the first guys who ever fought over a girl! Aelita: How about you? Would you fight over me, Jeremy? Jeremy: I fight for you every day, Aelita! Against XANA! Odd: Awww! That’s s-so beautiful…! Jeremy: Right, I’ve got a plan. Ok, this is the gallery, which I’m going to call G. This is where we are, this is the elevator landing which I’m going to call E. We’ve got to get to point E without being spotted by the Krabe, K. You get it? Odd: No, but I’ve got another plan! Odd: But uh, we’ve got a little problem here! Our friend Mister Krabe has busted all the scanners! Odd: Uh-oh, Jeremy, we’ve got another problem! Odd: Well…it’s a big banquet! XANA has sent us an entire seafood platter! William: Wh-what is that thing?! Odd: The very last scanner getting destroyed by a Krabe! Ulrich: You’re lucky. I wasn’t going to save you. William: Hey, what are you, crazy? What’s the matter with you? Ulrich: Stay away from our group! You got that?! William: Listen man, you’re the one that doesn’t get it! In the race for Yumi, I’m not in first place! Or didn’t you know? Jeremy: They’ll do everything they can to slow you down! Ulrich: I’ll take care of it. William: WE’LL take care of it! Jeremy: Well done, Aelita! Odd would be proud of you! 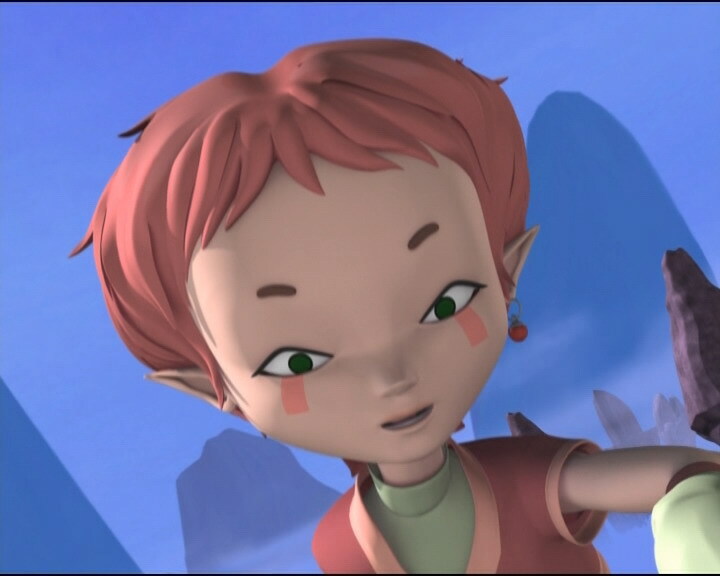 Aelita: I’ve got an idea! Jeremy: It isn’t dangerous, is it? Aelita: Uh…no! Odd showed it to me! Jeremy: Is that supposed to make me feel better?! Ulrich: Make my day, shrimp! William: What do we do now? Odd: Well I’ve got a slightly crazy idea! Hiroki: How many times have I told you? This is the guy you should go out with! 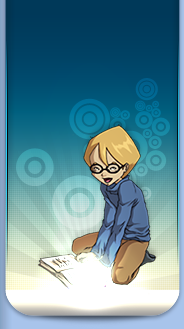 Hiroki: Ulrich, you’re the greatest! Odd: You were great, William. But you won’t remember any of it.